In a shallow dish, whisk together buttermilk and mustard. Add chicken, turning to coat all sides. Set aside and let stand for 15 minutes. In a small skillet set over medium-high heat, add panko - cook, stirring often, until golden, about 2 to 5 minutes. Place toasted panko into another shallow dish and stir in nuts, Parmigiano-Reggiano and rosemary - season with salt and fresh ground black pepper. Remove chicken from buttermilk mixture, discarding any excess liquid left behind. Dredge chicken in panko mixture to coat both sides. 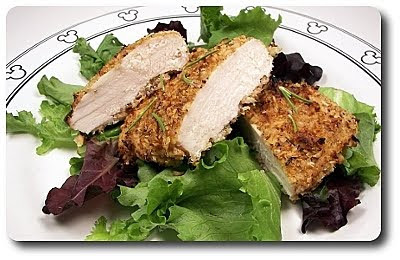 Place chicken onto a wire baking rack, coated with cooking spray and set over a large baking sheet. Lightly spay the tops of the chicken with cooking spray. Place into the oven and bake until the chicken is done, about 12 to 15 minutes.